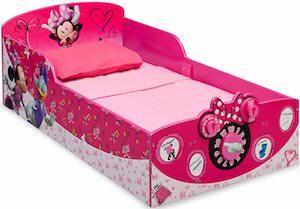 If your little one likes Minnie Mouse and need a fun bed then you have to check out this amazing Minnie Mouse toddler bed. The kids bed is pink and has Minnie Mouse images on it and even Donald Duck is there. And to make this toddler bed even better they added an activity board on the bed end complete with chores that need to be done every day like toothbrushing and wearing pajamas. There is even a day changer and a learning clock so that bed time is still a bit of learning time. I am sure you child is going to love going to sleep now.